Some people have an extra $1,000 just lying around to buy a digital projector. Unfortunately, most of the people that I know, myself included, do not. Here's how you can build your own digital projector on the cheap. Ed. note: The following guide comes from DIYer Randy Sarafan's 62 Projects to Make with a Dead Computer: (And Other Discarded Electronics). Read more abour Randy's projects and his book below. There is nothing worse than being broke and spending long nights on the couch eating cold leftover pizza and watching spaghetti westerns on a 15-inch tube TV. Okay, to be fair, you may like cold pizza, but a screen six feet larger surely couldn't hurt the situation, right? At the very least, you can give Clint Eastwood the justice he deserves, and you won't even need to rob a bank or hold up a stagecoach to make it happen. 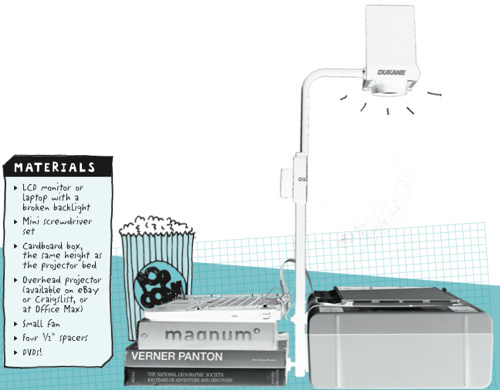 This DIY projector can be made for $150 or less (depending on how resourceful you are). Worst-case scenario, you may have to eat buttered noodles for an entire week to be able to afford it, but it's a doable short-term sacrifice for an extremely valuable long-term investment in large-scale entertainment. This project description is intended to provide you with ideas and techniques for repurposing electronic equipment that might otherwise be discarded. While the directions are intended to help you move in a step-by-step way toward the finished project, you should always use caution, sound judgment and common sense whenever handling electronic equipment. Be sure to always familiarize yourself with the safety warnings and instructions for any tools, equipment, and other materials you may use in any projects. And, if you are uncertain about your ability to safely perform any of the techniques described in this project selection, seek the advice of a professional. Once the LCD assembly is free, carefully remove the backlight panel from the assembly. Be careful not to break any electrical connections. You should be left with a brownish glass panel that you can just barely see through. 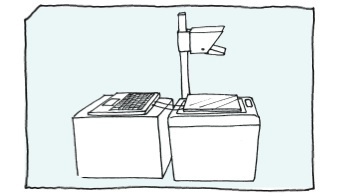 Use a box or pile of books to elevate the computer or LCD circuitry so that it is level with the bed of the overhead projector and the LCD can lay flat atop the projector bed. Place your 1/2" spacers under each of the screen's corners, to elevate the screen above the bed of the projector. 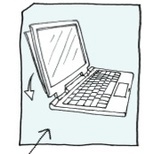 Note: The screen should be right side up or your image will be backward! Place a fan next to the projector and position it so that it blows air between the LCD and the bed of the overhead projector. 5. Ready, Set . . . Turn on both the projector and the computer. Once booted, insert your DVD. Turn off the lights and focus the overhead projector. Pop some popcorn (kernels are supercheap!) and settle back for an evening of the masterworks of Sergio Leone. For a sharper image, try covering up any large light leaks around the bed of the projector. Also, to protect the screen from yellowing over time from the heat of the projector lamp, you can install an IR and a UV filter inside your projector slightly above your lamp (but this will cost you a little extra hard-earned cash). Randy Sarafan is a new-media artist who is currently a Virtual Fellow with the cutting-edge F.A.T. (Free Art and Technology) Lab; is a top project contributor and community manager at Instructables.com, the leading user-generated how-to website; and has contributed to Make magazine. 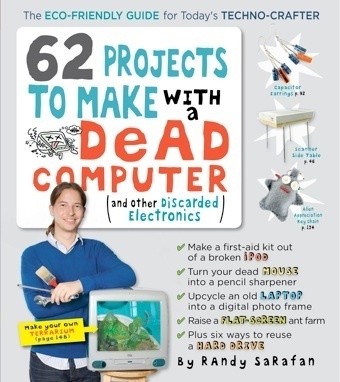 His new book, 62 Projects to Make with a Dead Computer: (And Other Discarded Electronics) is available at Amazon.